Located in Colem, the property lets you stay in the lap of nature with its lush green jungle themed decor. The well thought decor of the hotel lives up to its name and complements the location since the hotel is close to Bhagwan Mahavir Wildlife Sanctuary and Malabar Birding Camp. The property has a super stylish and unique decor. The entire hotel is designed to give the look of a jungle, right from the entrance of the rooms to bedrooms. 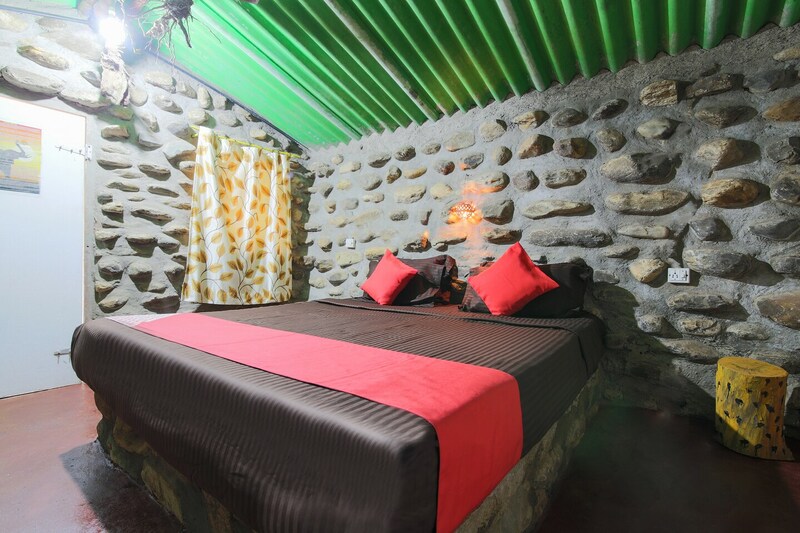 The walls of the bedrooms have animal paintings and huge stones that give the room a wild jungle theme. Bathrooms also complements the decor same way. The in-house restaurant has a decor with wooden logs and makes your stay a unique and memorable experience. The hotel is equipped with free internet, parking area, in house bar and restaurant, CCTV cameras, power back up and dining area. Card payment facility is also available here. The hotel is very close one of the Dudhsagar water stream. You will also find some budget restaurants to eat nearby like the Dudhsagar Udupi restaurant.